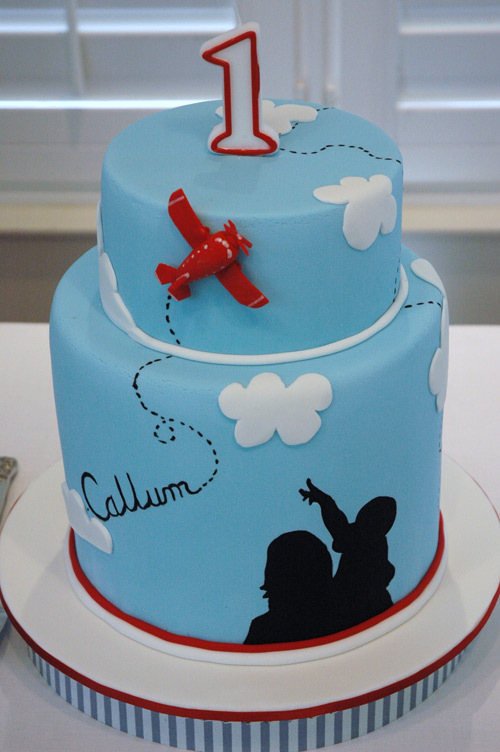 Here’s a red-white-and-blue birthday for boys that will have you reaching for the sky! Come inside Callum’s amazing aeroplane party. 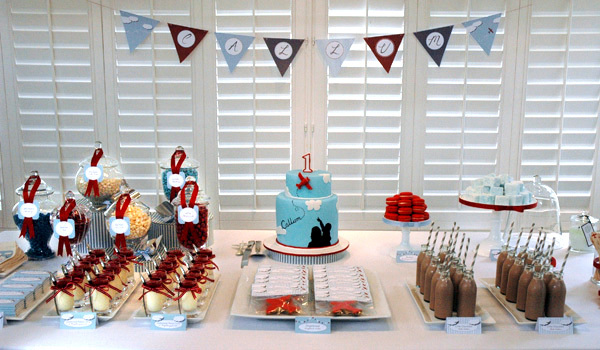 Yes, it does seem red, white and blue is a popular colour choice when it comes to parties. It’s cropped up here in a circus soiree, a bunting party, a Wizard of Oz spectacular and now in this sky-high celebration. And isn’t it spectacular! 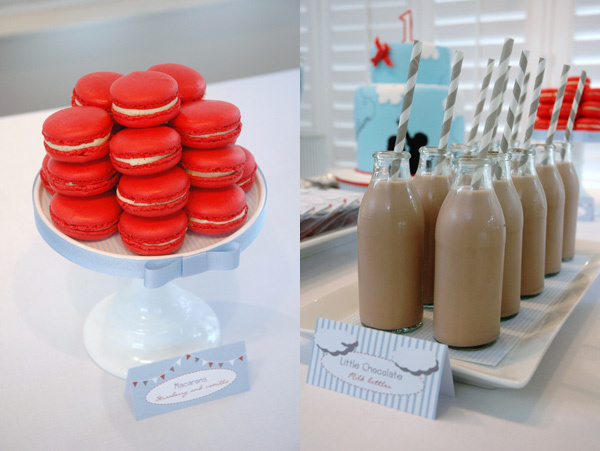 The attention to detail in Callum’s first birthday celebration is so incredible and the lovely styling so impeccable that it’s hard to believe this is the first party his mum Kylie has ever thrown. 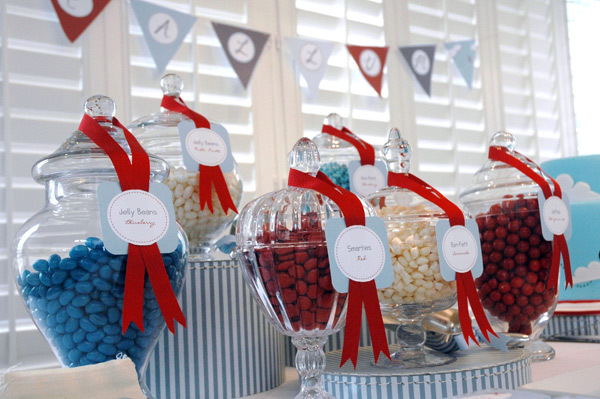 She’s been collecting those beautiful glass lolly jars on her table for years in anticipation of finding a special use for them one day – well, the very first birthday for your first-born child is certainly that. We love how Kylie chose the theme. Apparently Callum is going through a pointing phase and has quite a thing for aeroplanes, so his little fingers spend a lot of time jabbing at the air. So Kylie decided an “up in the air” theme would be perfect. Of course, we agree! 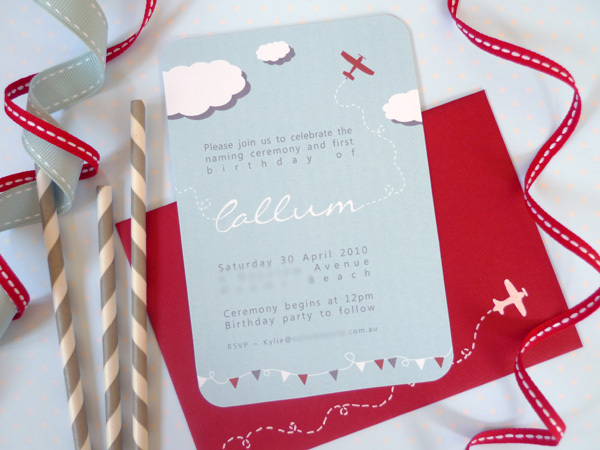 Kylie designed the sweet invitations and envelopes herself and printed them on her home computer, along with all the other stationery bits and pieces like the matching take-home tags, chocolate wrappers and sweets table menu signs. Look at the darling lolly bags. They were plain when she found them at Sharnel Dollar Designs but Kylie designed the motif and then hand-printed it onto each bag using simple iron-on transfers. But that’s not all. 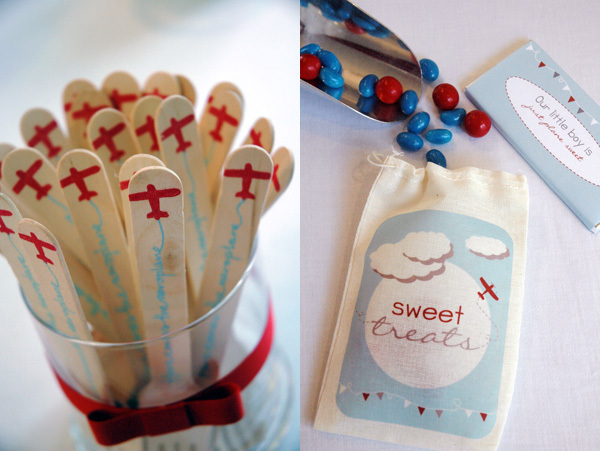 She even hand-stamped little red aeroplanes onto the wooden cake forks to match her theme. 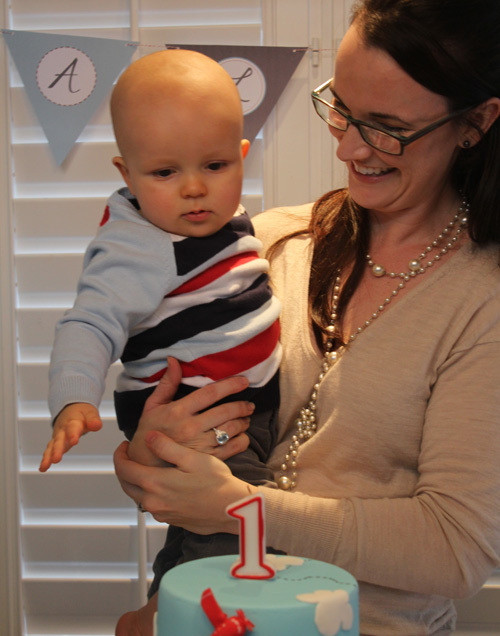 Clearly, creative talent runs in the family because just look at the cake baked and decorated by Callum’s own grandmother! And guess what? It’s her first attempt at a birthday cake too. Admittedly, she has finished a course at Planet Cake, but still. All we can say is `wow’. 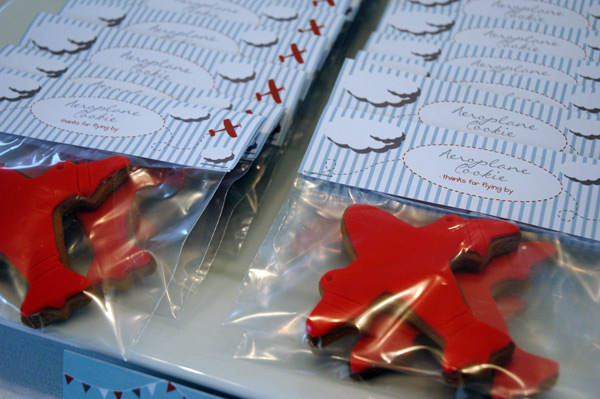 Kylie and her mum also made their own marshmallows, raspberry panna cotta and the adorable plane-shaped gingerbread cookies, which they slipped into individual zip-lock bags with matching handmade thank-you tags for people to take home. We’re not surprised that most didn’t even make it past the front door before being promptly eaten. The chocolate is Lindt, purchased from Kylie’s local deli and rewrapped in her own personalised labels. Finally, here’s something this amazing duo didn’t make themselves! 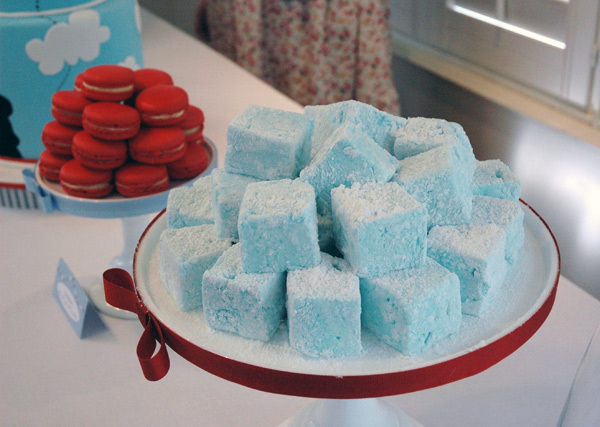 Mouth-watering strawberry and vanilla macaroons from Sydney’s La Rennaisance Café. They’re seen here on a divine milk glass platter from Donna Hay’s General Store that Kylie prettied up with some ribbon and decorative paper by Cristina Re. Here’s another idea we can’t help but adore. 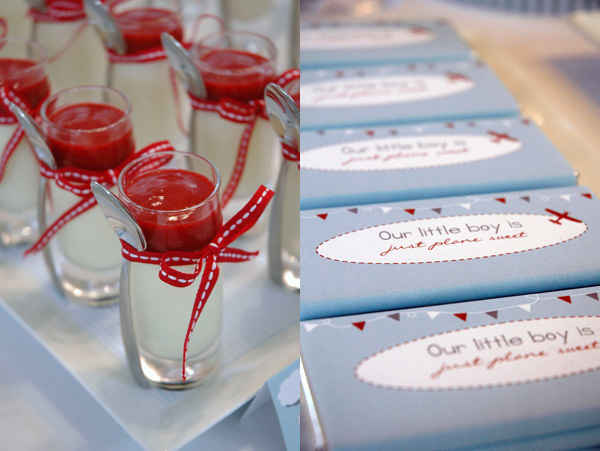 All the guests, even the adults, toasted the birthday boy with his favourite drink – chocolate milk, sipping it through matching paper straws from Occasion by Design.